AviTracks-CM is a web-based software application designed specifically for chronic care management service providers. With AviTracks-CM you can automate your entire care management workflow - from enrolling the patient, documenting medications, tracking phone calls and other interventions, to generating reports needed for billing purposes. For providers participating in Medicare, this includes supporting documentation for CPT code 99490. AviTracks-CM is a cloud-based SaaS solution offering extremely affordable monthly subscription plans that grow with you as your business grows. AviTracks-CM is highly configurable to meet your specific needs and can be implemented in a matter of days – with no large upfront costs or ongoing maintenance fees to worry about. No need to worry about security either - our HIPAA compliant hosted solution includes comprehensive security technologies and full data encryption across five fully redundant data centers. 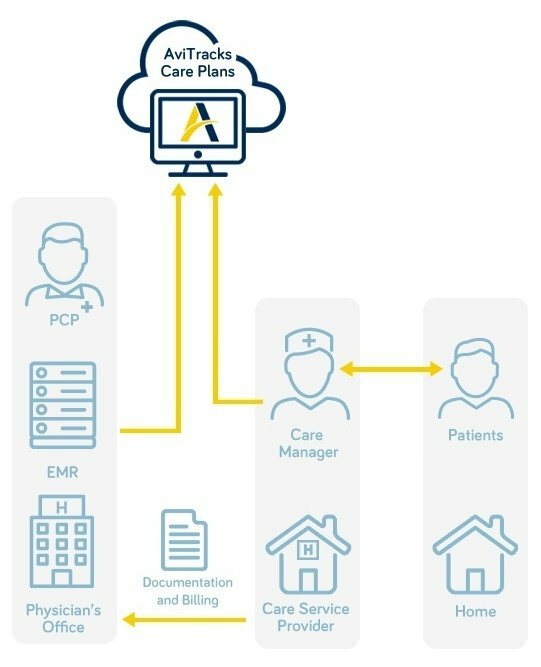 With AviTracks-CM you can collaborate and share information with the extended patient care team and easily integrate with EMR’s to bring patient records and demographics into our system. And with the flexibility of our software, you can keep up with the rapid pace of change in healthcare - to quickly and easily adapt when new industry opportunities and regulations present themselves.